If the specter of another US foray into regime change disturbs you, google the word “Tanter.” If the prospect of another country’s being bombarded with US weapons outrages you, and if inserting the adjective “nuclear” into the narrative sends a chill up your spine, go to the “Guardian” website and search “Tanter.” Or if you hanker to find out what a Robust Nuclear Earth Penetrator can do to humankind, click onto the Union of Concerned Scientists. 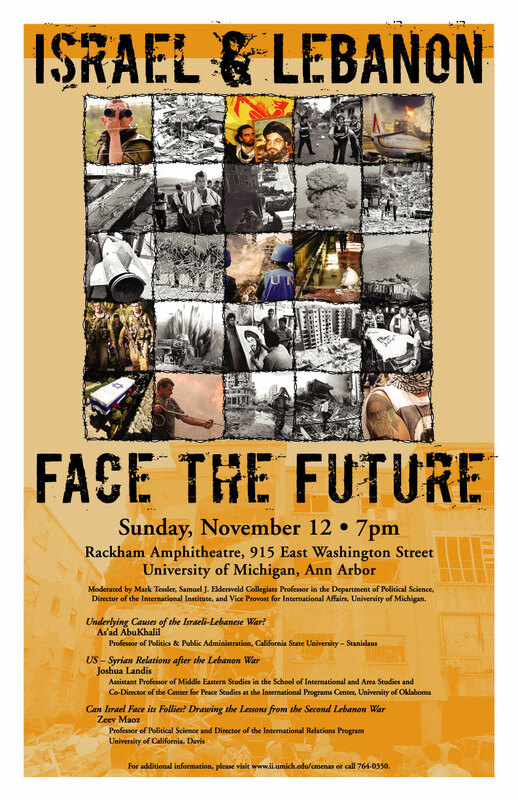 But if you want to take a stand against another US/Israeli war crime, don’t come to Ann Arbor. Not unless you’re prepared for the worst. Unless you’re prepared to be brutalized by the cops, thrown in jail, and subjected to improper and punitive medical treatment, you’d better keep your mouth shut. Or so the University of Michigan, the Ann Arbor Police, and the Zionist forces in the community would have it. It takes real genius to create a martyr out of Saddam Hussein. Here is a man dyed deep with the blood of his own people who refused to fight for him during the United States-led invasion three-and-a-half years ago. His tomb in his home village of Awja is already becoming a place of pilgrimage for the five million Sunni Arabs of Iraq who are at the core of the uprising. But life did not get better after 2003. Face-to-face interviews with 2,000 Iraqi adults by the Iraq Centre for Research and Strategic Studies in November revealed that 90 per cent of them said the situation in their country had been better before the US-led invasion. Only 5 per cent of people said it was better today. The survey was carried out in Baghdad, in the wholly Sunni Anbar province and the entirely Shia Najaf province. It does not include the Kurds, who remain favourable to the occupation. Featuring Professor As’ad AbuKhalil: Underlying Causes of the Israeli-Lebanese War?, Professor Joshua Landis: U.S. – Syrian Relations after the Lebanon War, Professor Zeev Maoz: Can Israel Face its Follies? Drawing the Lessons from the Second Lebanon War. Thursday, November 2. 8:30 p.m.
international network of anti-Zionist Jews. This is an exciting step for the International Jewish Solidarity Network (IJSN), an emerging organization of Jews around the world who are committed to building a movement for justice in the Middle East around anti-Zionist/non-Zionist principles. Also I designed the ad so that is cool too. Visit the IJSN website to find out more. We are halfway there…please help us reach our first goal of $500 and help us support ACCESS in their efforts to deliver medicine to the people of Lebanon! Despite the ceasefire between Israel and Hizballah, the humanitarian crisis created by the U.S.-supported bombing of Lebanon continues. On Tuesday, Jean Fabre, a spokesman for the UN Development Programme (UNDP) reported, “The damage is such that the last 15 years of work on reconstruction and rehabilitation, following the previous problems that Lebanon experienced, are now annihilated.” According to the UNDP, amongst the major problems that Lebanon faces is that of access to clean water as a result of bombing of underground waterpipes and sewers. Along with the mass destruction of civilian infrastructure, unexploded munitions now litter Southern Lebanon. While the people of Southern Lebanon need our political solidarity and our organizing against any continued aggression from Israel and the U.S., what they need most right now is humanitarian relief and a chance to survive this crisis. Critical Moment is offering the following fundraiser offer for humanitarian relief in Lebanon: Thanks to the generous contributions of a donor who would prefer to remain anonymous, every donation (up to $500.00) raised will be matched dollar-for-dollar with a donation to Critical Moment. This is an excellent opportunity to express your solidarity with the people of Lebanon while also supporting Critical Moment. Funds raised for humanitarian relief will be given to the Dearborn-based Arab Community Center for Social & Economic Services (ACCESS) who are working to ensure that our donations go directly to helping provide relief for the people of Lebanon. Make your secure donation here.